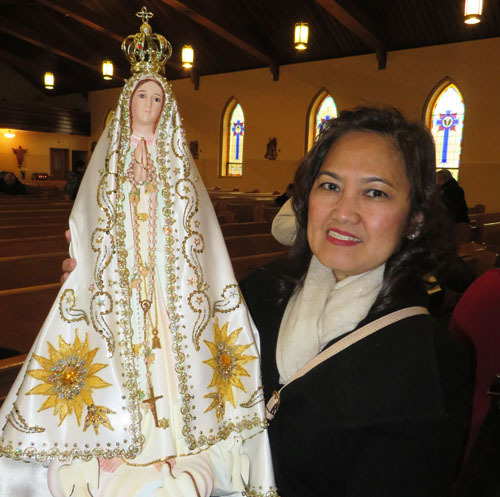 Ruth writes: It was one of the most joyful religious events I’ve ever experienced. There was laughing and dancing. I kept thinking that no one’s going to believe me. And I must tell my friend Francisca – it’s going to make her home-sick. She lives in Europe at the moment, but her heart is in the Philippines. I heard of the event in a Filipino newspaper. I telephoned sponsor Ben Estrella and he said everyone was welcome, and yes, I could take pictures. 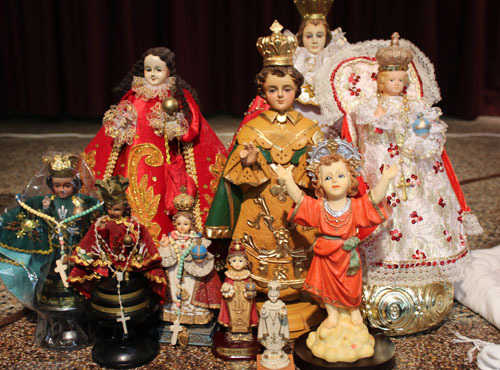 I imagined then a row of beautiful but static statues of the Holy Infant, the baby Jesus. The 30th anniversary festival was in St. Ambrose Church in Etobicoke. 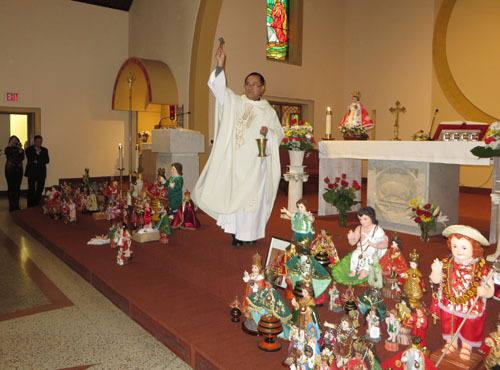 It started out quite solemnly with a mass in the presence of about 150 statues of the Santo Niño. Belonging to different people who had brought them to be blessed, they were lined up in front of the altar. Little hands were raised in blessing. Then the priest sprinkled them with holy water. The occasion ended with some lively dancing in the church hall. Men and women, boys and girls, carried the statues in a procession around the hall. Then some of them swung the deity in time to the cha-cha, “The Twist,” and yes, I heard the popular Korean favourite “Gangnam Style.” It was obvious these people loved and respected their statues and they wanted their deities to share the fun. In between the mass and the dances was a feast of pork, rice, noodles, fried chicken, vegetables and desserts – all free. While everyone ate, I studied the different versions of the Christ child. It was a wonderful collection of religious art. It was too bad more outsiders weren’t there because the ceremony was so meaningful to the large crowd, and no one should miss the unusual dances. We found the Filipino(a)s friendly and very welcoming. I think only three of us out of a couple hundred people were not Filipino. 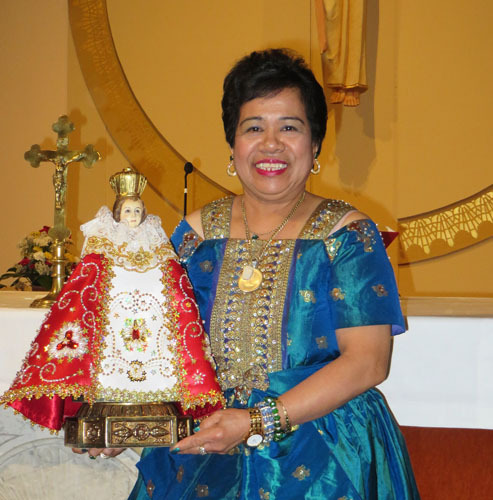 The first statue of Santo Niño was taken to the Philippines by the Portuguese explorer Ferdinand Magellan in the 1500s. 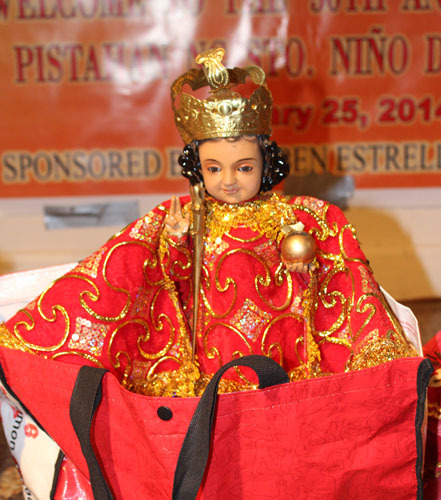 Santo Niño became the patron saint of the city of Cebu there. 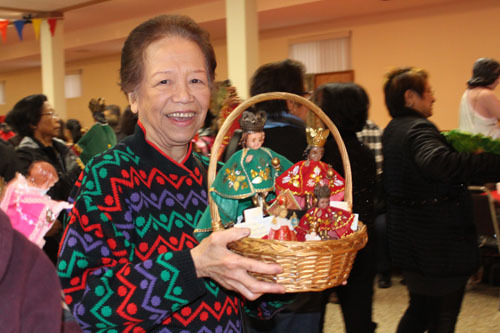 The Etobicoke event attracted Filipino(a)s from all over the GTA. Francisca would have loved it too. Oh yeah… I sure know how Pinoys love to party, even on occasions others might celebrate more solemnly. Still, they put their entire hearts and souls into the occasion, whatever it is. Like you, Ruth, and knowing how friendly and hospitable most Filipinos are, I am surprised not more Canadians came out to party with these good folks in Toronto. Glad you enjoyed it, Ruth! Lovely post. What a delight to read your blog on this year’s Pistahan. 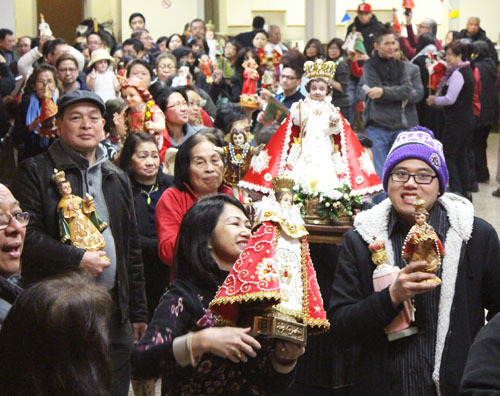 You have wonderfully described one of the most festive and religious events celebrated by Filipinos in the Philippines and abroad – our devotion to Sto. Nino de Cebu. Thank you for attending our annual Pistahan. It’s great to hear you had a joyful experience. Hope to see you again next year. 2017 update: Pistahan Ng Santo Niño de Cebu. Holy Mass. January 21. 11am. St. Patrick’s Church, 131 McCaul Street. (at Dundas Street near AGO). 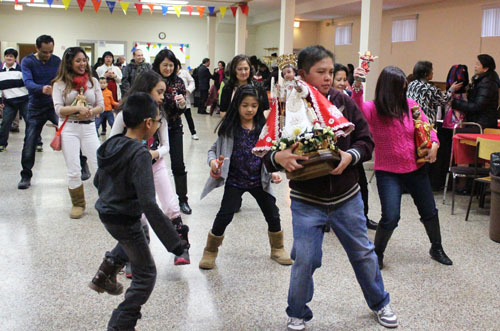 Bring your Santo Niño. This annual event was first organized in 1983. The Estrella family also presents a similar event in honour of the Black Nazarene on January 14 at 11am at St. Patrick’s Church.